Scientists Replicate Female Reproductive System In A Dish To Aid Research : Shots - Health News Scientists have assembled a lab system from living tissue that can replicate a woman's 28-day hormonal cycle. The goal is to use the system to find new ways to treat a host of women's health problems. 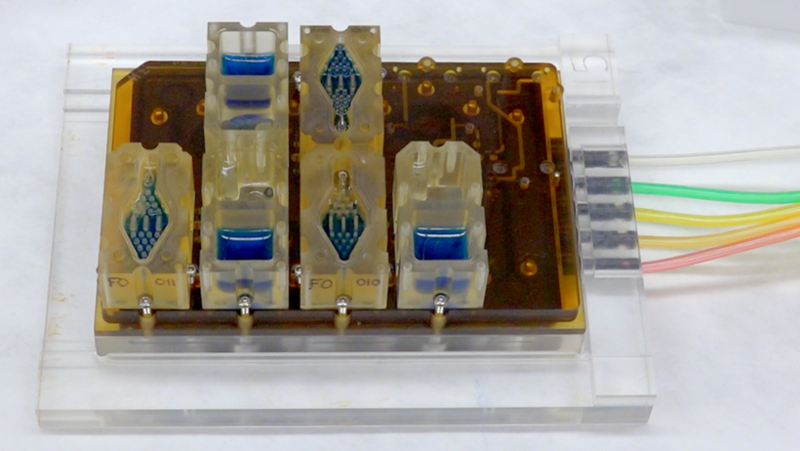 EVATAR is a book-size lab system that can replicate a woman's reproductive cycle. Each compartment contains living tissue from a different part of the reproductive tract. The blue fluid pumps through each compartment, chemically connecting the various tissues. Scientists say they've made a device in the lab that can mimic the human female reproductive cycle. The researchers hope the device, assembled from living tissue, will lead to new treatments for many medical problems that plague some women, ranging from fibroids and endometriosis to infertility, miscarriages and gynecologic cancers. The researchers described the device Tuesday in the journal Nature Communications and dubbed it the EVATAR. The name, they say, is a play on the word "avatar." "An avatar is kind of a digital representation of an individual in a virtual environment," says Teresa Woodruff, a biomedical engineer in the department of obstetrics and gynecology at Northwestern University who helped create the system. "So when we thought about this synthetic version of the female reproductive tract we thought of the word EVATAR." To create the EVATAR, the researchers used tissues from human fallopian tubes, a uterus and cervix donated by women who had undergone surgery. The researchers placed each tissue type in separate plastic chambers that were connected through passageways that allow fluid to circulate among them. One chamber contained ovarian tissue from mice because human ovarian tissue is difficult to obtain. The device is about the size of a paperback book. It also includes human liver tissue to filter toxins from the system. The researchers were able to trigger the system to produce the cascade of hormones that usually occur during a woman's 28-day reproductive cycle. The cycle culminated in the ovarian tissue releasing an egg. "We were able to recapitulate the full menstrual cycle — a complete menstrual cycle," Woodruff says. The scientists hope to use the system to learn more about the basic biology of how the female reproductive tract functions. The researchers hope that one day such devices might be able to be tailor-made from the stem cells of individual women, to test the safety and effectiveness of new drugs for that individual. "EVATAR allows us to think about all the organs kind of connected in a way that eventually we hope will be the future of personalized medicine," Woodruff says. Lansing Taylor, director of the University of Pittsburgh's Drug Discovery Institute, who was not involved in developing the system, says it could be especially useful in research because of the complexity of the female reproductive system. "It's a very important paper," Taylor says. "Human reproductive tissues and organs have been particularly difficult to investigate." The scientists stress that they only want to use the EVATAR to study anatomy and try to develop new treatments. But at least one bioethicist wonders if others may someday try to combine this kind of technology in worrisome ways with other advances in reproductive medicine. "Certainly the technologies are rapidly moving forward where one could imagine these technologies being used to create a baby outside the womb in the laboratory," says Insoo Hyun, a bioethicist at Case Western Reserve University. That would raise many ethical issues. "If, hypothetically, you can fertilize an egg outside a body and carry it all the way to term outside the body, then who's responsible for this baby now?" Hyun says. He also stresses that scientists are nowhere near being able to do that yet. In the meantime, the Northwestern researchers have already started to work on a male equivalent of the EVATAR. They've created a system involving male testes and prostate tissue they call the "Dude Cube." They are working on a more complex system that would connect the Dude Tube to other parts of the anatomy — a system they dub the "ADATAR."